I know a lot of you are pretty excited about Yiruma 이루마 performing in Singapore on 5 April 2014. He is one of the composer-pianists that shapes my composition style, after Yukie Nishimura, Kevin Kern, Suzanne Ciani, to name a few piano composers. And, add Missa Johnouchi to the list, which I found over Spotify. The 2 signature Yiruma songs that he is wildly famous for are “Kiss the Rain” and “A River Runs Through You”. If you love his music style, I believe you would also like my Piano Spa series. It is not like the usual spa music, typically defined by calming background sounds of the waves or the birds. My first Piano Spa album was published in 2005 and my compositions are melodic songs which many people confuse – in a good way – with Kevin Kern’s. No fret if you missed all my previous albums. My almost complete Piano Spa compilation of 108 tracks (from Piano Spa 1 to 5) – titled Best of Piano Spa Serenity is available from iTunes (link here). You can also stream from popular online music stores like Spotify, KK Box. Piano Spa 6 is available in Singapore music stores like Popular CD-RAMA, and I am currently working on a seventh album. 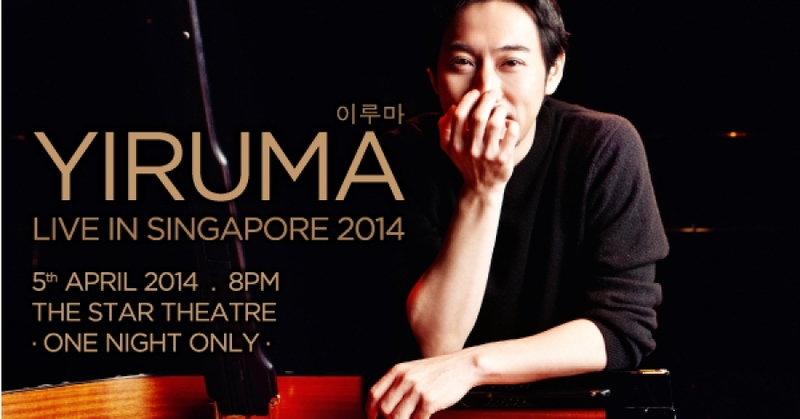 Tickets to Yiruma concert are available from SISTIC, from S$38 to S$168.